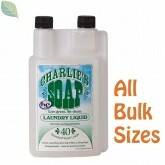 Biokleen Laundry Liquids (available here in Large Sizes) are Concentrated to reduce packaging, waste and energy usage. Containing No artificial fragrance, colors or preservatives, Biokleen's Liquid Laundry Detergents use plant based surfactants, including grapefruit seed & orange citrus extracts, in the Free & Clear, Citrus & Cold Water Laundry Liquid versions, to help remove the toughest dirt, grease, stains and odors, and extracts of Lavender & Eucalyptus, in the Sport Version to help remove tough Grass & Dirt Stains & Neutralize Odors Caused by Perspiration. 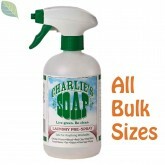 All the while all formulas are gentle enough to wash cloth diapers, delicate fabrics and hand-washables. And Biokleen Laundry Liquids all rinse clean, without leaving residue that can irritate skin or ruin fabrics. And Biokleen Laundry Liquids get clothes exceptionally clean and odor free! Great product. I have been using it for years and have suggested it to family & friemds who now use it...when they can find it. And my clothes are so clean, why choose anything else?